Maine Narrow Gauge and the WW&F Announce an Unprecedented Collaboration! The Wiscasset, Waterville & Farmington Railway Museum of Alna, Maine, in collaboration with the Maine Narrow Gauge Railroad Co. & Museum of Portland, would like to announce an unprecedented exhibition: the Narrow Gauge Railway Collection. The Maine Narrow Gauge Railroad Core Collection, highlighted by the only historic two-foot gauge parlor car ever built in the United States, the Rangeley, will be displayed at an enhanced exhibition facility on the Sheepscot campus of the WW&F Railway Museum. The exhibit will also include other select artifacts from Maine’s unique two-foot gauge railroad systems. These special pieces will be arriving at Sheepscot Station throughout 2019 for public viewing and operation on the WW&F Railway. Further information can be seen on each museum’s webpage: www.mainenarrowgauge.org and wwfry.org. Inquiries can be directed to info@wwfry.org. The Maine Narrow Gauge Railroad “Core Collection” is defined as: Parlor Car Rangeley and combination car 14 (both from the Sandy River and Rangeley Lakes Railroad), and coach 16 Mount Pleasant and caboose 32 (both from the Bridgton & Saco River Railroad). “Other select artifacts” include Locomotive 8, plow 2, & tank car 14, all from the B&SR RR. The “enhanced exhibition facility on the Sheepscot Campus” includes enhancements to existing structures to provide additional exhibition and display space and better visitor facilities. Displays will be prepared and presented to the public within the exhibition space. Maine Locomotive & Machine Works of Alna has been an active supporter and partner in this venture; they will provide storage for some other pieces of the MNG collection, assist with transportation services, and play a part in maintenance and restoration of certain pieces. Look forward to jointly-produced events which highlight the partnership and utilize this equipment for unique operational opportunities on the WW&F Railway. 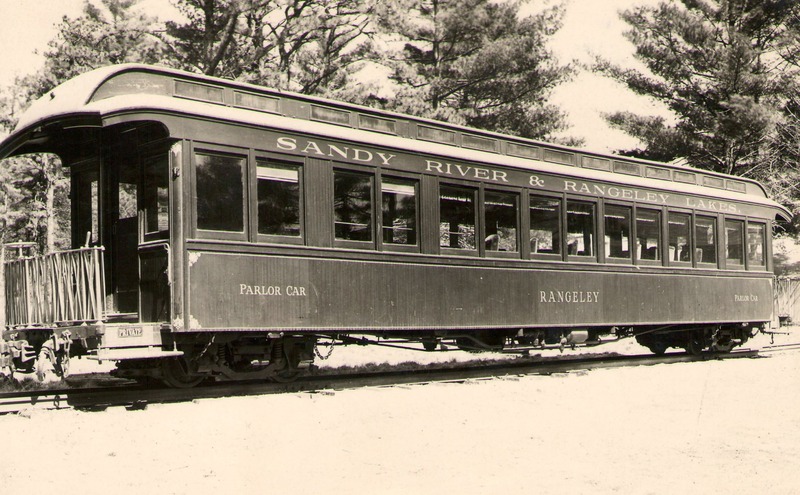 The Rangeley, the only 24″ gauge parlor car in the United States. Photo courtesy of the MNG Archive. 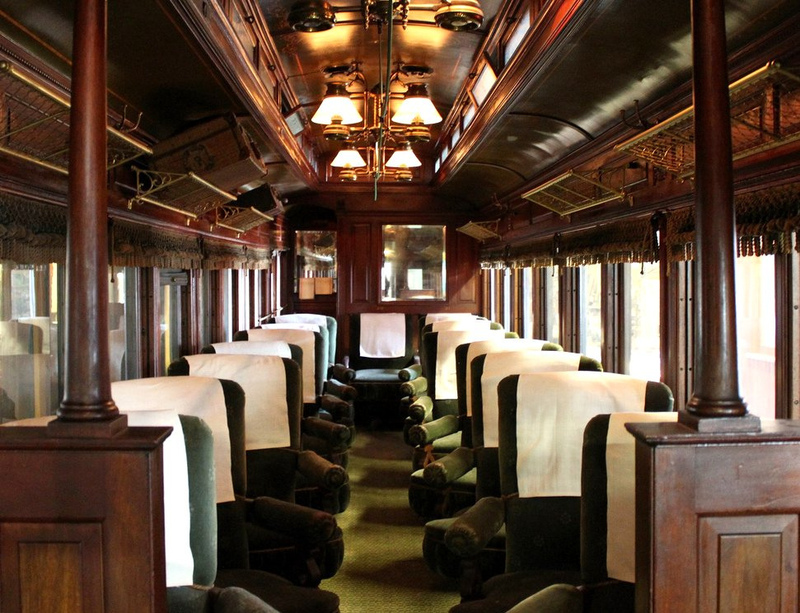 Ornate interior detailing of the Rangeley, the only 24″ gauge parlor car in the United States. Photo courtesy of the MNG Archive. Previous PostWW&F at the West Springfield, MA, Railroad Hobby Show Jan. 26 & 27!Next PostThank You, Leigh Webb and the Mass Bay RRE!